Mike was surprised about two things. He was surprised at how much precision their driver and tour guide, Richard Mick, used when piloting a Jeep full of Mike and his family out across the rugged, steep, hazardous, and beautiful terrain of Moab, Utah. And he was surprised at the capability of the Jeep itself. It was a modded JK, but Richard also drives a TJ with very minimal modification. The grades were insane, so steep they don’t really make sense to your brain. A machine shouldn’t be able to scale that. Or a mountain goat. But Richard drove up and down the rocks with ease and aplomb. Mike captains the good ship StreetsideAuto.com, and earlier this summer, he got a chance to escape the madness for a while and explore the great American interior with his wife and two kids. They had to make a stop in Moab, but thought that once out on the advanced trails, the driving itself was best left to the experts. Thankfully, they came across Dan Mick’s Guided Jeep Tours, one of the most respected and knowledgeable Jeep tour companies in the Southwest. Dan has been Jeeping since the ’70s and leading professional Moab Jeep tours since the early ’90s. He pioneered some of the most popular Moab trails on the map. When his son, Richard, was old enough, he began leading tours, as well. Later, as their customer base grew and grew, Dan added his brother-in-law, Curtis, and his daughter, Lacy Ann Shepherd, to the drivers roster. RM: “We actually have a pretty special arrangement as far as collector’s items. We have a prototype TJ Rubicon. We do alot of testing with Chrysler, and they sold us one of their prototypes for a dollar. Right before they went bankrupt and sold to Fiat. I still have that one today. It’s the main one I drove when I was little. Our TJs aren’t super modified. They still have 35s and a 3 inch lift. Nothing serious. The stock lockers work really well. We don’t need to change those. We call it the Little TJ. RM: “Yes, we have two 4-door JKs that we use. They’re obviously heaven sent for our little tour operation. More legroom, more doors. We even put a third row seat in ours so we could seat four adults and two kids. We were just talking yesterday about buying a couple more 4-door JKs and retiring the TJs. RM: “For the weekend warrior, I would stick with the short arm kit, and only raise it about 2 or 3 inches. TeraFlex makes really good short arm kits. They make all the brackets and everything a little bit beefier, but you don’t have to cut all the brackets and reweld them, and you actually get a little bit more clearance in front of the wheel. 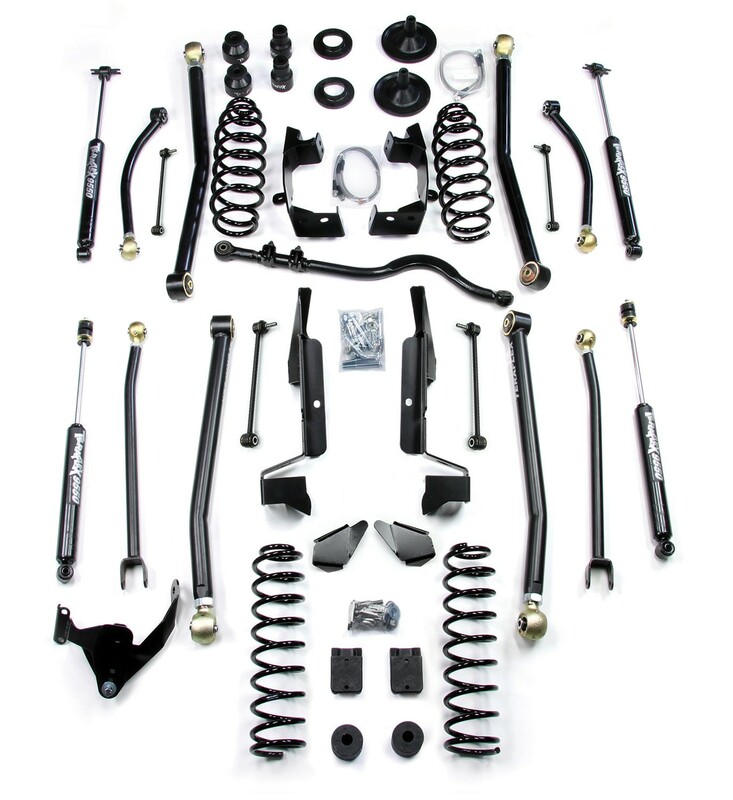 If you do alot of driving like we do, you definitely want a long arm kit to keep the stability. Lockers are a must out here. You get one tire in a pothole and another in a rut, and you’re just spinning all day. We like ARB lockers because we can turn them on and off when we want them. We have so much traction out here that when they are engaged, there’s no turning at all. Just very straight up the obstacle, then you turn them off. The ARB lockers give you such versatility, because they’re not just lockers. If you get the right setup, you can have a whole air compressor unit and you can air up all your tires. “I would also suggest RCV axle shafts. Backing up in a Jeep, especially with the wheels turned, is actually really hard on those U-joints. They don’t last long out on the trail. But we’ve never had any problem with the RCV axle shafts. Body armor in general. 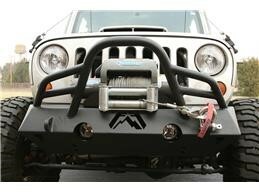 You don’t want a big, huge bumper, just big enough to protect the frame. That way you won’t get it hung up on stuff. Rock sliders, definitely. We plan on bottoming out. We use that to help us Jeep. We just slide around the obstacles rather than have a huge lift. We only have 4 inch lifts, and that works out really well for us out here. If you want to book a tour with Dan Mick’s Guided Jeep tours, check out their website or their Facebook page, or just give them a call at 435.259.4567. Their rates are extremely reasonable, and the experience is unforgettable. The Micks love community, too, and they’re happy to let you follow along in your own Jeep once you feel you’re ready. We added some links up there to some of the Jeep mods Richard mentioned, so you can get started on your own Moab-ready machine, but keep in mind that Jeep parts fitment can be very specific and specialized, so remember to check fitment before purchasing. If you’re not sure what you have or what you need, drop a note in the comments or give us a call at 877.787.8989 and our expert American techs will make sure you’re getting the right stuff. Often when we picture a Moab-ready Jeep, we think of a purpose-built, heavily-caged rock crawler with tires taller than most horses and suspension travel best measured in yards. But even in stock form, a Wrangler can get started out in a place like Moab, and after a few JK mods, you can start hitting the more advanced trails.